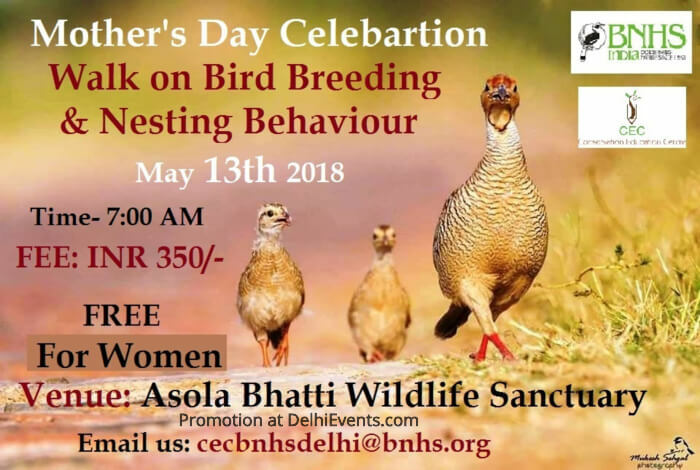 Event Description : WALK : BNHS, CEC-Delhi presents "Bird Breeding and Nesting Behaviour" celebrating Mother's Day. Come and celebrate Mother’s Day by a walk on bird breeding and nesting behavior with BNHS at Asola Bhatti Wildlife Sanctuary. Bring your mother and grandmother to see the colorful birds. Summer is a highly competitive season for birds to raise families. Nearly all birds are in the most beautiful plumage at breeding time. Where the male is more beautiful and brightly colored than the female. During the breeding season you may have watched one adult bird feed another. The walk will include whole cycle of singing, fighting, courting, building a nest and raising a family which is the most important activity and the climax in a bird’s life. Asola is a good place for the nesting and most of the summer migrants come in this area for the breeding purpose. It will be a knowledgeable birding experience and a great way to spark interest in bird watching.